This entry was posted in Uncategorized and tagged 2011, California, Napa Valley, Red, Red Blend by aaronandteri. Bookmark the permalink. Hi, I was looking for the Flying Heart and it directed me to your website. So I would like to get the information about this particular wine, where can I buy them…Do they still exist? Thank you in advance for your reply to my message. And I like your website…it’s cool. Hi Lisa. 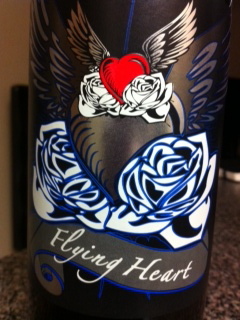 The 2011 Flying Heart Red was an exclusive only to Trader Joes. It was produced by the custom and private label winery, Fior di Sole (they also produce Spiral wines), located in Napa Valley, California. I am unsure it Trader Joes’s is still selling it, but your local TJs would be the best place to look and ask the staff.